I'm looking through my fabric closet looking for projects that won't take long to finish up, so I can have more fun playing with my quilting machine. These yellow and gray bricks were already cut, so they were next. Quilting is super fun swirls. This will be another go-to pattern that I will offer to customers. I am getting much better at remembering to drag and drop so the computer remembers where the design is when the quilt is advanced. This keeps the quilting design rows correctly spaced over the entire quilt top so the design doesn't overlap the previous row or have a big gap between rows. I am ready to start quilting for customers and have quilted the first quilt of 2017 for Andrea, my very loyal quilting customer. You'll see that project after the quilting labels I've ordered arrive. The backing is a fun bird print, and the binding is a gray crosshatch. Pattern: Bricks, cut 3.5" x 6.5"
Fabric: Various modern geometric, dots, and circles in yellows and grays. Quilting: Digital e2e swirls on Gratitude. This quilt is for sale in my quilt shop! One of my next projects is Mountain Reflections. 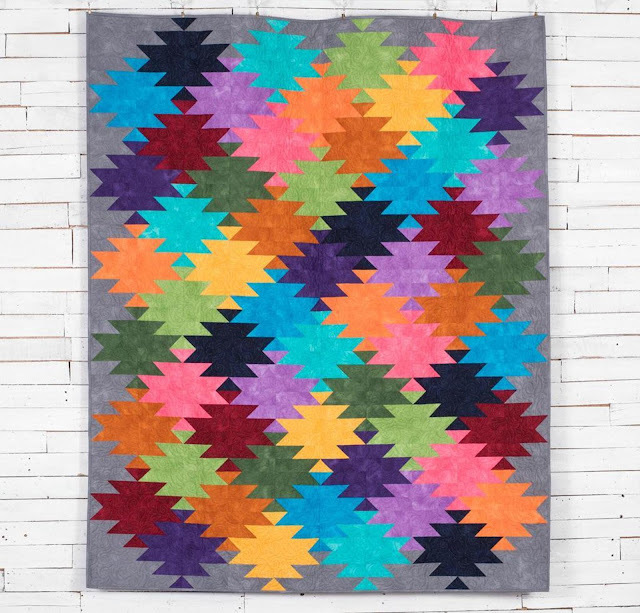 It's right up my alley with bright colors and fun piecing. My design wall is downstairs in my quilting room and my sewing room is upstairs, so I will get lots of exercise with this one. Color placement is too important to not lay it out as I go. It would work out well to have Gratitude quilting away while I work on this quilt! Mountain Reflections is on clearance this weekend for $45, not bad for a twin size quilt! I bought the kit with backing since it's 55% off. This is just one of the many items on clearance! Your quilt looks great! I love the swirl quilting! Internet is out at my house until next so I'll only comment on this one! I wanted to post, but too hard from my phone! I love your yellow and gray quilt! They are both really pretty! I need to find time to do another yellow and gray one.